The interesting thing about the La Trappe Brewery is that they are the only authentic Trappist brewery outside of Belgium. The International Trappist Association is comprised of 15 monasteries, and some of the products they produce are labeled as 'authentic Trappist products' which means that they are produced by the monks on the monastery grounds, and profits are intended to benefit the community. Seven of these monasteries produce beer, and it is generally considered some of the best beer in the world. 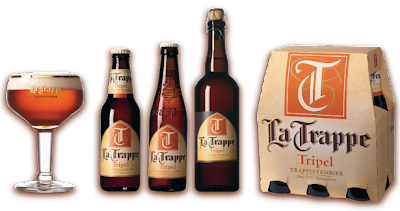 They are Achel, Chimay, Orval, Rochefort, Westmalle, Westvleteren, and the subject of this post, La Trappe. La Trappe is one of the easier Trappist beers to find in the states, although I believe all of them but Westvleteren can be found legally. I was first introduced to the Tripel after picking up a 4-pack at the old Marcello's and fell in love. This was one of the beers that really put me past the swill and even the Abita-level beers of the world and really got me interested in the world of craft beer. It features a honeyish, caramel, spicy aroma and a taste to match, all malty and expertly hiding the 8% ABV. I'd highly recommend anyone looking to expand their beer horizons to seek out a 4-pack of these, and if you like it, there are dubbels and quads available too!